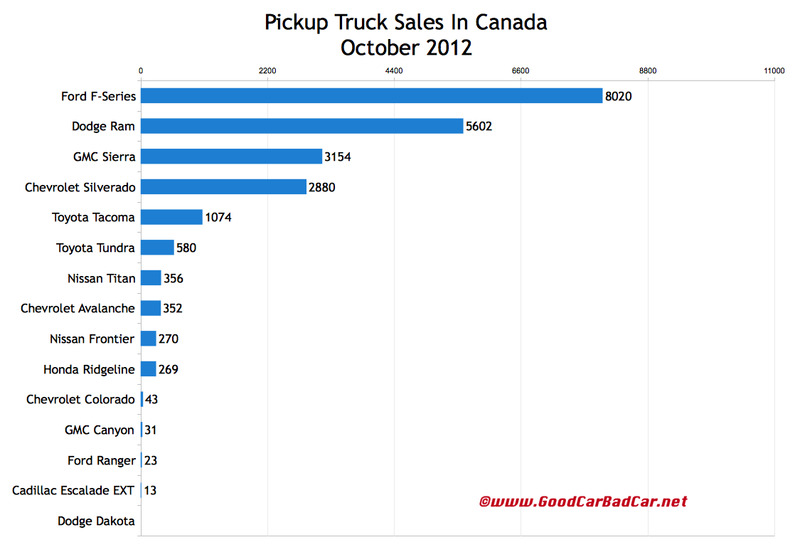 Model by model, the October 2012 and year-to-date Canadian sales results for 15 different pickup trucks are listed in the table after the jump. Trucks are ranked by October volume in the accompanying chart, which you can click for a larger view. But these are the numbers you won’t see without doing the math: 22,667 pickup trucks were sold in Canada in October 2012. That’s 16.7% of the overall new vehicle market. 35% of those trucks sold were Ford F-Series pickups. 11% of the trucks were sold by Japanese automakers, although they account for more than one-third of the pickup nameplates. 7744 minivans and mini-minivans were sold in Canada in October 2012, equal to 5.7% of Canada’s overall new vehicle market. Think the F-Series was dominant in the truck category? Dodge’s Grand Caravan represented 43% of the minivan segment. That’s down from 49% in September when the Chevrolet Orlando and Kia Rondo weren’t so strongly challenging the Grand Caravan at the less costly end of the minivan market. 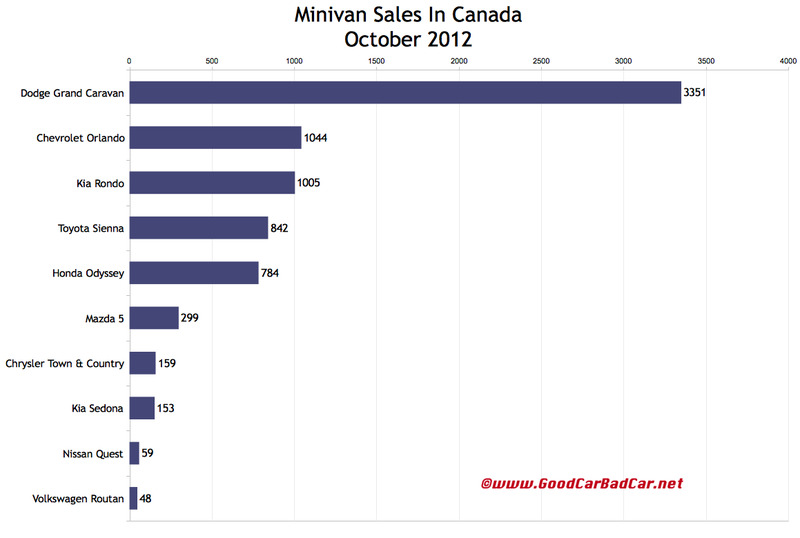 The Orlando and Rondo combined to own 26% of Canada’s October minivan market, up from 16.1% in September. Although Toyota and Honda have sold more Siennas and Odysseys in the first ten months of 2012, the Orlando/Rondo superiority in October will come as a shock to American observers who have never been able to buy an Orlando and haven’t registered a Rondo since last December. As will always be the case in the future, historic brand and corporate totals (monthly and yearly going back to 2004) are now available through the dropdown menu at GCBC’s Sales Stats page, along with results for more than 260 currently sold vehicles. That’s where you’ll find out that Kia Rondo sales are up 253% compared with October 2010. Detailed October 2012 and year-to-date U.S. sales figures for 15 trucks and ten minivans are visible below. If the vehicle you’re looking for isn’t grouped together with these vehicles, perhaps you’ll find it in one of the many segments you can access through the eighth dropdown menu on GCBC’s Tally page.